I hope this pachinko game will have more to do with Megaman than just slapping that series's official art on the cabinet. You should have added a picture of one of the older machines or the machine style being made to make the article stand out a bit more :( Felt unusual without the usual picture there man. Unacceptable. We need a REAL game. That's exactly what this thing is going to be. I mean, come on. It's Crapcom. I became aware of the Pachinko machines when I heard Ganbare Geomon's more recent release being a Pachinko game. The game has different scenarios that play out depending on what you score, whether Goemon wins a battle or loses in a humorous fashion. Apparently it did so well it's going to have a sequel released soon. It's...A start. And I'm sure it'll be more than just official art slapped on a cabinet, RADIX. But...Come on, Capcom! This has Japan-Only written all over it! Give us something the West will surely get! Not surprising, since Konami is making a third Pachislot Castlevania game. Good news here though is that it is in fact a new Megaman game, showing that the franchise may not be as dead as some of us have said. Yet more proof that Mega Man is only an important brand to Capcom when no actual GAMES are involved. Do you really think this is a new megaman game?Like really? Unacceptable.. SIGHING! No Pachinko, please! We need a real game!!! COME ON!! JEEZ! All the fun of ball bearings and gravity, now in zesty new Mega Man flavor! 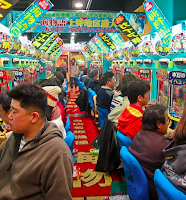 Pachinko is wildly famous in Japan. That's where this lackluster machine is going to be made and that's where it's going to stay. Not that it's a bad thing. Rockman has to be marketed somewhere. Remember, everyone. Capcom is fairly certain no one likes Mega Man in America! Anyway this machine will probably be MegaMan Universe redone...featuring Mega Man and Ryu and Zombies, oh my! Here's hoping the Rockman version gets a Legends theme. It needs all the exposure it can get. @Anonymous: Does it even matter? It's not like this thing will be released outside of Japan anyway. Hey Capcom, develop a GOOD game instead of a Pachinko nobody cares about. Oh, wait, you forgot how to develop good games long ago. Go to hell. So this is what it comes too. *sigh* See yah, Mega. It's been nice being with you while it lasted. Once again, this proves how the once great Crapcom is becoming the most hated gaming company in the world. A pachinko MegaMan game? I predict it will fail, big time. At least Nintendo and other gaming companies are doing good than Crapcom. Like for example, Namco finally decided to release Tales of Grace f for the PS3 in the US next year. Geez, I hope Crapcom comes to its senses in the future, if that happens, I won't call them Crapcom anymore.